Alessandro Bonanno, Sam Houston State University distinguished professor and a Texas State University System Regents’ Professor of Sociology, will share with honors students how “SHSU is at the forefront of this social research” on Monday (Oct. 15). Bonanno’s Honors 3332 Journeys Seminar lecture, “The food that we eat: Globalization and sustainability,” will begin at 4 p.m. in the Smith-Hutson Building’s Haney Auditorium, Room 186. The presentation will focus on the work Bonanno is doing on global food. “This has been the central theme of my research for a number of years, and I have published extensively on it. I will touch upon the challenges associated with food production and consumption, focusing on the social aspects of it,” he said. “The essence of the issue is that while food is a basic human need, the ways in which is produced and consumed are based on the satisfaction of economic interests of global actors. Bonanno joined the SHSU faculty in 1996 and served as professor and chair of the sociology department until 2011, when he was appointed a scholar-in-residence with the College of Humanities and Social Sciences, for which he is responsible for the development of research, online instruction and international programs within the college. He was appointed “Distinguished Professor of Sociology” in 2008 and Texas State University System “Regents’ Professor of Sociology” in 2011. Bonanno has researched the implications of globalization on social relations and institutions; in particular, he has investigated the impact that globalization has on the state, democracy and the emancipatory options of subordinate groups. This research has resulted in 14 books and more than 100 referred publications. His lecture, sponsored by the Elliott T. Bowers Honors College, is part of a class designed to show students what characteristics lead to success. After a three year hiatus, SHSU’s Haven initiative will recruit faculty, staff and student allies this semester as it resumes providing resources and support to the university’s gay, lesbian, bisexual, transgender and questioning population. Two fall 2012 LGBTQ training sessions will be on Oct. 17, from 3-4:30 p.m., for faculty and staff and on Oct. 24, from 7-8:30 p.m., for students. Both sessions will be held in Lowman Student Center Room 302. The training will provide LGBTQ information, available resources, and discussions on LGBTQ topics and how it relates to the college culture, collaboratively discussing LGBTQ equity, promoting awareness and understanding of LGBTQ concerns, presenting information on how to be a helpful and effective ally, and providing valuable resources for LGBTQ topics, according to Maryam Ilahi, staff psychologist for the SHSU Counseling Center. Haven, a campus-wide effort begun in 2009, was created to promote inclusion and advocacy on the SHSU campus, through which faculty and staff members provide a “safe zone” for the LGBTQ community to discuss issues without having to worry about being discriminated against or admonished for their sexual orientation. Training is limited to 25 participants, and the deadline to register is Oct. 15. For more information, contact training leaders Ilahi, Shannon Reed, or Jenna Wright at org_haven@shsu.edu, or to register for a training session, stop by the Counseling Center or Residence Life Office and pick up the registration form. Carlton Green, a post-doctoral fellow at the University of Houston, will return to Sam Houston State University on Tuesday (Oct. 16) to share his experiences as part of the Student Advising and Mentoring Center’s Grassroots speaker series. Green, a former SHSU employee who worked within the Student Activities department in several capacities for 10 years, will answer questions about his life and career beginning at 5 p.m. in College of Humanities and Social Sciences Building Room 140. Green earned his bachelor’s degree in ethnic studies from Southern Methodist University and later returned to school to earn his master’s and doctoral degrees from Boston College. He is currently serving as a multicultural postdoctoral fellow with the University of Houston’s counseling and psychological services. Because the “Grassroots: A Series of Conversations on Leadership in a Diverse Community,” which was created in April 2003, was designed to promote career aspirations and academic achievements of SHSU’s minority students, Green was an ideal candidate to speak, according to Bernice Strauss, SAM Center director of academic support programs. “He is a first-generation college student who has done very well for himself,” Strauss said. “He went back to school and got a doctorate and is at UH, where he focuses on a group whose needs are similar to the Grassroots target audience. “I thought it would be nice to have him back,” she said. The lecture is sponsored by the SAM Center’s academic support programs; the Elliott T. Bowers Honors Program; the International Hispanic Association; Lambda Theta Alpha Latin Sorority, Inc.; the NAACP; the Ronald E. McNair Postbaccalaureate Achievement Program; Student Success Initiatives Office; and Women United. School of Music professor John Lane and the Percussion Ensemble will give new meaning to “rock concert” during a “ROCK-tober Fest” performance on Wednesday (Oct. 24) in the James and Nancy Gaertner Performing Arts Center Payne Concert Hall. 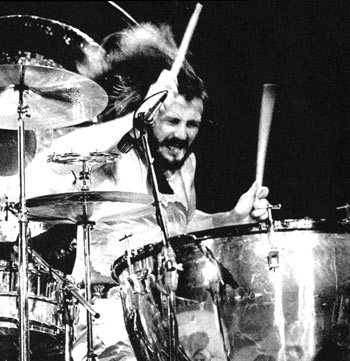 The program, which will begin at 7:30 p.m., is inspired by and centered on Christopher Rausse’s “Bonham,” an homage to Led Zeppelin drummer John Bonham, who was arguably one of the most famous rock drummers of all time, according to Lane. During the performance, a drum set soloist will sit in the middle of the stage while seven other percussionists surround him playing all kinds of instruments. From there, other rock music will be performed, though Lane said the point of the concert is not to just play the pieces as vernacular “pop” music, but to create new characters with them by making new arrangements. Lane then looked at his theme quite literally: actual rocks. “I have a whole book of music, and it’s all pieces for playing rocks,” said Lane. “The students went out and collected rocks, and they’re going to play these pieces with actual rocks. Some of the best rocks are right outside the Performing Arts Center. For traditionalists, the first piece of the program is what Lane describes as a “standard percussion concert work,” a percussion quartet by Vietnamese composer P. Q. Phan that fits into the theme because of the title, “Rock Blood,” which will provide a component to the “ROCK-tober Fest” program for all rock fans. Tickets are $15 adults, $12 seniors, and $5 for SHSU students. Fore more information, or to make reservations or purchase tickets, call the GPAC Box Office at 936.294.2339 or visit shsu.edu/cofamc/boxoffice. The Law Enforcement Management Institute of Texas, through its professional development program, is expanding opportunities for current and future female law enforcement executives through a series of one-day seminars, an annual conference, and a newsletter. As a continuation and a complement to the Leadership Inventory for Female Executives, LEMIT will kick off a new series on Nov. 12 with “Women Incident Commanders—Tales from the Hot Seat,” a seminar for females in law enforcement who may be assigned command in high-risk critical or catastrophic events. The session will focus on the incident command system and the role of the incident commander, designed for female executive leaders who may have a potential role in critical incident management, leadership, or advisory capacity. Experienced female critical incident commanders, command staff, and general staff section chiefs will share their best practices and challenges related to decision-making in crisis across an all-hazard incident approach spectrum. The predominant focus of the session will be on leading in public safety high-risk critical and catastrophic events through a lens of female leadership. National Incident Management System, as well as international perspectives on crisis management, also will be discussed. Among the panelists will be the detective chief superintendent for the Metropolitan Police in London who was a borough commander during the Tottenham riots, as well as female commanders from recent natural disasters in Texas to include hurricanes and tornados. "This seminar will be a wonderful opportunity to continue learning from women in executive level law enforcement positions,” said Rita Watkins, LEMIT executive director. “As each incident is unique so is the way these law enforcement executives managed them. This is an event that creates a new level of professional development to the LIFE program." Other future sessions planned for 2013 include mentoring and coaching, succession planning, and technology. Works by Sam Houston State student and faculty composers will be among the “free-for-all” of music events starting on Wednesday (Oct. 17). Beginning at 4:30 p.m. in the Gaertner Performing Arts Center Recital Hall, the second annual Ars Perpetua New Music Free-for-All will feature new works by student composers, as well as works created within the past 50 years by other contemporary composers. The program will include “Of the Fountain,” by junior Joseph Vranas; “No Thought Went Into This Title,” a “very academic piece designed mostly by calculations,” by senior Nathan Mays; sophomore John Arensdorf’s “A Duet for Cello and Piano,” which will be performed by Arensdorf and cellist Jessica Barnett; senior John Paddie’s “Thoughts;” and two works by senior Daniel Vallery, including “Take, O Take Those Lips Away” and selections from “Nine Preludes,” “very exciting new short piano solos performed by the composer himself,” according to Kyle Kindred, assistant professor of music and co-coordinator of theory and composition. Ars Perpetua, the SHSU student composers group, was founded in 2008 to create and support new music on the SHSU campus through collaborations with local and regional performers and artists. The group is actively involved in creating music for the Intersection New Music Collective and the award-winning student film organization Raven Films, Kindred said. That evening, SHSU faculty composers will have their turn to present their new works. Beginning at 7:30 p.m. in the GPAC Recital Hall, the Faculty Composition Recital will feature the works of B. P. Herrington and Kindred. The concert will include three original pieces by Herrington, including “Hymn and Shimmy,” written in “a venerable Southern tradition” in 2012; the 2010 work “Pastorale,” a piece “full of ornamentation from Southern folk traditions;” and the 2012 “Stories I could tell: little poems for clarinet quartet,” a set that traces back to work Herrington did as an undergraduate student, according to Kindred. The program will also showcase two of Kindred’s works, his 2009 “Three Virtues,” three movements dedicated to a retired Montessori school teacher who worked with terminally ill AIDS patients; and his 2003 “ELE-Variations,” a commissioned piece that has been performed in the United States and Germany. On Friday (Oct. 19), SHSU’s Concert Choir and Women’s Choir also will present their first concert of the year, performing a series of contemporary and classical pieces. The concert will begin at 7:30 p.m. in the Gaertner Performing Arts Center Concert Hall. “If you enjoy quality music, this concert will not disappoint,” said Denise Eaton, adjunct professor and conductor of the SHSU Women's Choir. Sam Houston State University dancers will perform a variety of student-choreographed pieces as part of the semiannual Dances@8 fundraiser concert on Wednesday and Thursday (Oct. 17-18). Performances will begin at 8 p.m. on both days in the Performing Arts Center Dance Theater. “The concert will feature a variation of genres including hip hop, contemporary, modern, and ballet, all pieces are choreographed and performed by students,” said Alexis Preston, XTE president. “In previous years we've had Khaos Step Team and Fade to Black, who will be returning to perform again this year, as well dance majors and students on campus that have a passion for dance. “It's an entertaining night and a great exposition of talent that Sam Houston State students have to offer,” she said. Student admission is $5, a “low price for high-class performance,” and all proceeds benefit Chi Tau Epsilon, according to Preston. Though the winners of the Sam Houston Memorial Museum’s third annual amateur photography contest have already been selected, two photographers who choose to document the exhibit’s reception will have an opportunity to win a prize as a new component to this year’s contest. Winners in each of the eight categories will be announced tonight (Oct. 15) during the exhibit’s opening reception, from 5:30-7 p.m. in the Katy and E. Don Walker, Sr., Education Center Exhibit Gallery. Photos taken at the reception can be emailed to the museum’s exhibits department, to cmr022@shsu.edu, where they will be uploaded to a “Contest Photo Album” on Facebook on Oct. 16. “Our Facebook friends will be able to 'like' the photos, and the two photos that receive the most 'likes' by Friday, Oct. 26, will win,” Roon said. The third annual amateur photography contest was a resounding success, according to Roon. “We have close to 500 photo entries this year, the biggest turnout yet,” she said. “Each year the contest is growing in popularity, and we are thrilled with the response from the public. We have received entries from all over the United States, including two international entries—from Poland and Australia. The museum-sponsored contest annually recognizes non-professional photographers in the categories of “Huntsville,” “Sam Houston Museum,” “Landscape” “Floral,” “People,” “Architecture” and “Animals,” as well as a “Youth” category for photographers 16 years old and younger, whose work can be on any subject matter. Prizes will include $200 for “Best in Show,” $100 for “Curator’s Choice,” and $20 for first, $15 for second, and $10 for third place in each of the categories. Pieces are judged by a panel that changes each year. The reception is open to the public and refreshments will be served. 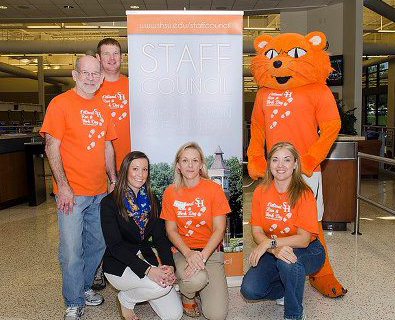 Approximately 123 Sam Houston State University staff members accepted the challenge to “Run@Work” during the nationwide event presented for the first time at SHSU by the Student Health Center, Recreational Sports and Staff Council on Sept. 21. In its seventh year nationally, Run@Work Day is designed to encourage employees to get 30-minutes of exercise daily, which can distinctly improve one’s physical health, according to the Road Runners Club of America, the national presenter of the event. As part of the inaugural SHSU-sponsored event, representatives from the Recreational Sports Center, Student Health Center and Staff Council provided information regarding living a healthy lifestyle and how to sign up for the SHSU Employee Wellness Program, as well as distributed snacks, pedometers and T-shirts to those that met their walk/run pledge for the day. The events took place in the RSC. “Overall, this event was a success, and we hope to spread the word so that it will be even bigger and better in the years to come,” said Kelly Byrd, administrative coordinator for IT@Sam and Staff Council representative. Photos from the event are available on the Staff Council Facebook page, at facebook.com/SHSU.Staff.Council, where SHSU staff members also can obtain information on upcoming events and Staff Council news. For more information on the Run@Work Day program, contact the SHSU Staff Council at staffcouncil@shsu.edu. As the SHC’s medical technologist for more than three years, Young responsible for the clinic’s laboratory. Young lives in Huntsville with her husband and two children. She loves to get together with her family and friends to enjoy good food and good company, she said. The Staff Council's "Spotlight on Staff" award is given monthly to a university employee as a way to learn about other staff members and to recognize and show appreciation for the work he/she does for the university. 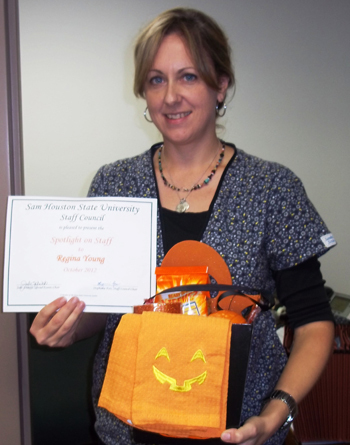 Staff members are randomly selected by the council's public relations committee and are surprised with a certificate of appreciation and a basket of SHSU items, gift certificates and homemade goods.